On and off over the last few months, I’ve had the occasional rant and Twitter heckle about how hard it seems to be getting going with Linked Data, not least because the there appear to be so few rungs at the bottom of the getting started ladder. Meaningful example queries are given separately for all the datasets, and in many cases appear to have been chosen so that you can recombine fragments from two or more queries in order to produce more complex queries. 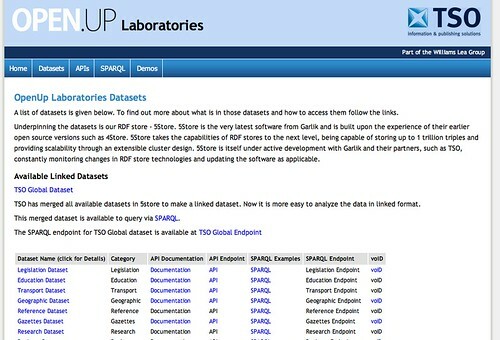 So for example, in the research datastore, I could readily combine elements of the query [t[o find all the projects, which started in 2010 with the query to [f]ind the details for all the projects, whose project status is live and are funded by Technology Strategy Board to come up with a mashed together query to find the projects that started in 2010 funded by the Technology Strategy board. So I went to DBPedia and searched for JISC (<Joint_Information_Systems_Committee>), and the EPSRC (<Engineering_and_Physical_Sciences_Research_Council>), and tried those queries, although they failed to return anything. But at least there was enough of a crib in the example queries to help me start thinking about possible queries I might be able to make on a research projects database. We are looking for ideas of how you, the public, want to have that information made available to you. What different pieces of information do you need to make that informed decision? How would you want that information presented to you – on a map, combined with other statistics, delivered as a regular email? 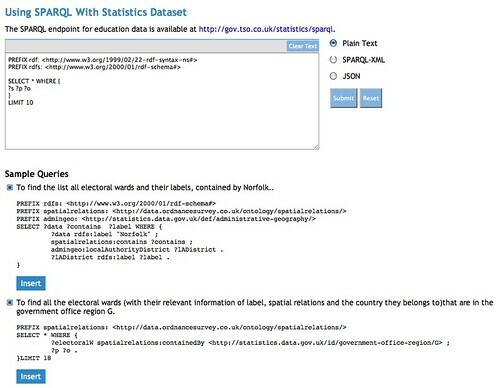 What other information does government data need to be combined with to make it more useful? We are looking for ideas from everyone; parents, students, businesspeople, GPs, local government officers, pensioners and everyone else who has ever needed to use a piece of government information. This is your opportunity to share your ideas, win £1,000 and have your idea developed. If you’re a developer, or just want to get involved we would love to hear from you as well. The closing date for the OpenUp challenge is now 31 December 2010. The best five ideas will then be selected and if yours is one of them you’ll be invited to pitch your idea for 10 minutes to a panel of experts. They will have the difficult job of choosing the winning idea which will be brought to life with a £50,000 development fund as well as £1,000 cash for the creator of the idea. It would be really great of you guys could also publish the schemas for these datasets! without the schema it is almost impossible to write a meaningful and complex queries!